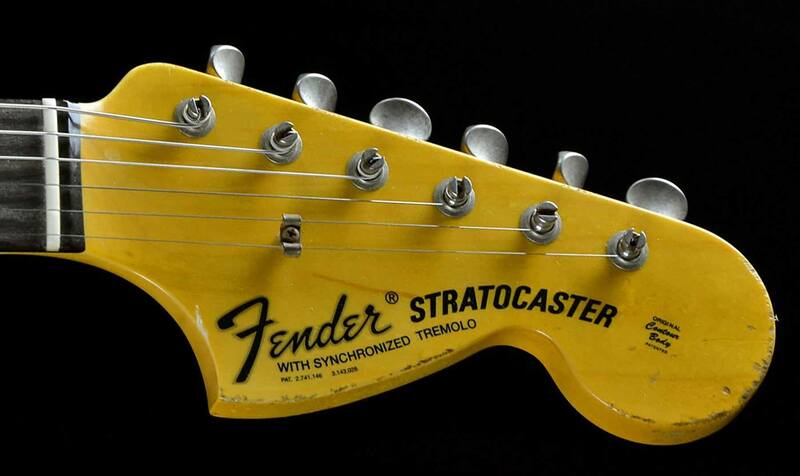 Brief History of the Fender Stratocaster electric guitar. 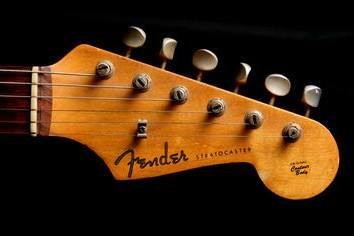 One of the top 20 most popular guitars in history is the Fender Stratocaster or “Strat” designed prototype in 1953 and introduced into production in 1954. The 1954 to 1959 Fender Stratocaster electric guitar specifications were a one piece detachable 21 fret 7″ radius fretboard maple neck that had a “small peghead head-stock with old style spaghetti logo” attached to an ash body with 4 long screws through a metal square/rectangular steel plate , the pickups were three single-coil pickups with staggered pole pieces and Bakelite covers replaced with plastic covers in 1956, three control knobs with a master volume control & two tone controls for the neck and middle pickups, a three-way pickup selector switch, single ply white pickguard, and vibrato tailpiece, the case was a brown form fitted case with plush red lining. These were the normal production specs from 1954 through 1959 aside from a change in the case from form fitted to rectangular tweed & cream & brown cases, and options for a rosewood fretboard and alder body option. Non vibrato options were available as well. 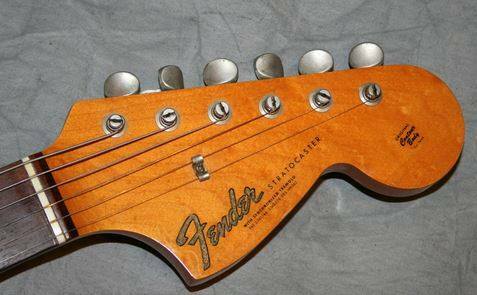 The 1959 to 1965 or Pre-CBS Stratocaster was quite similar but with these changes: a two piece neck with rosewood glued over maple, old style spaghetti logo was discontinued in late 1964 and the new transition logo (see photos) was introduced, triple ply pickguard and rectangular black cases. The 1965 to 1971 era exhibited more changes offering a maple fretboard glued over a two piece maple neck and a one piece option was available later on as well, the peghead/headstock became larger in size and still retained the gold larger Fender transition logo that changed to black letters in 1968, the tuning keys also changed from nickel to chrome and the four bolt plate with serial number included an “F” on it. 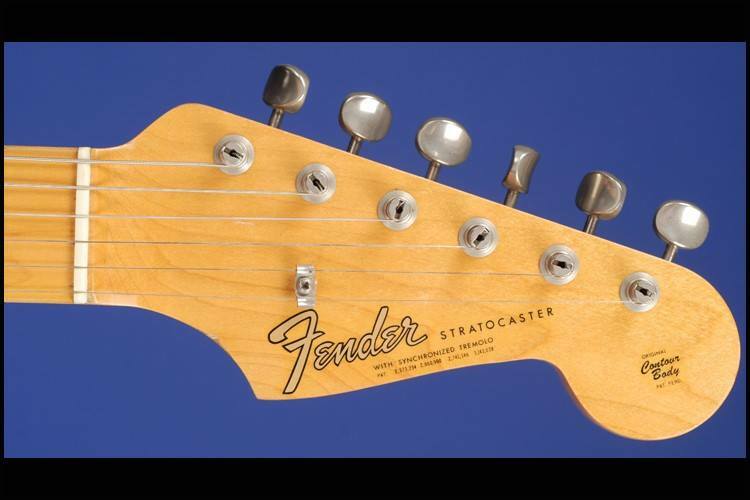 The 1971 to 1981 Stratocasters had many more changes more notably the 3 bolt neck with built-in tilt adjustment, die cast chrome, “bullet head truss rod adjustment at front of fingerboard on large peghead, glossy polyester finish, a heavy bodies. These were the least desirable Stratocasters but as years go on many collectors and players are appreciating certain attributes of this era. While there were many other variations and options this covers the main differences. 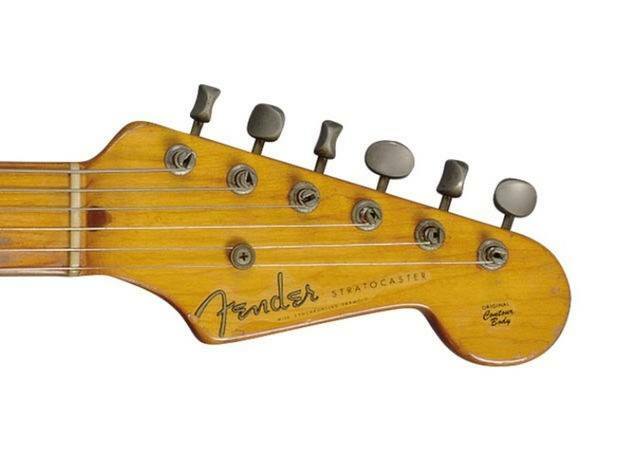 Below are examples of how the peg head-head stock and Fender logo has changed over the years.